MANILA, Philippines – The UAAP and the NCAA, the top two collegiate basketball leagues in the country, had its fair share of great and surprising moments for 2018. Here, we get to relive them as they're immortalized after a shutter click. Without a doubt, nothing else could have trumped the story of the UP Fighting Maroons in UAAP Season 81. After starting off the year with 3 losses in their first 4 games, UP looked like they had nowhere to go but… nowhere. However, graduating star Paul Desiderio has had enough of sad endings year after year and willed his team onward to their first Final Four appearance in 21 years, where they arranged a match with their twice-to-beat tormentors Adamson Soaring Falcons. With the initial goal already achieved, it looked like a great time to settle down and let Adamson finally have its first playoff win in the Franz Pumaren era. But as good as underdog stories can be, the Maroons clipped the Falcons in two straight thrilling games with the entire UP system looking on to book their first Finals appearance since 1986 – the year they last won the basketball title. Desiderio took over in the nail-biting, winner-take-all Game 2 overtime period, scoring 5 straight points including the game-winning jumper over Adamson captain and “UP killer” Sean Manganti. 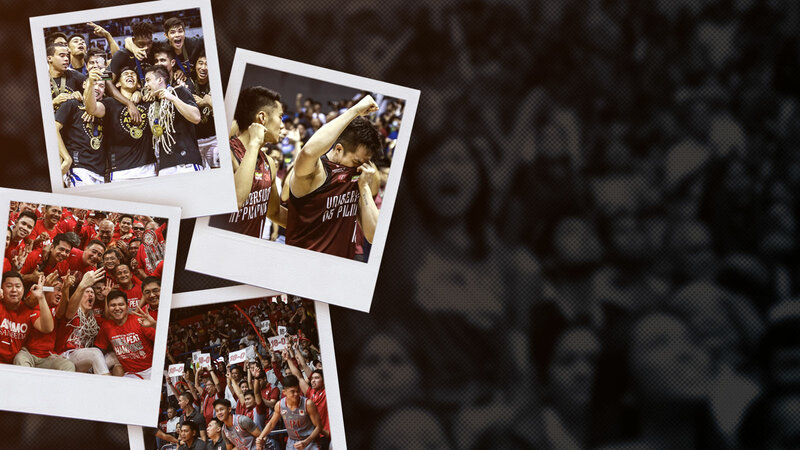 Manganti saw his UAAP career end in utter heartbreak as UP moved on to face its Katipunan neighbor Ateneo Blue Eagles in the sold-out Season 81 Finals. However, all feel-good stories had to come to an end as the defending UAAP champs looked to write one of their own. Despite the Ateneo crowd being somewhat overpowered by the roaring sea of maroon in the Season 81 Finals, the boys in blue flexed their muscle like they always have and booted out the Maroons in a clean 2-0 sweep towards their second straight UAAP title. Reigning back-to-back Finals MVP Thirdy Ravena showed exactly why he’s the best at the biggest stage as he recorded a new career-high 38 points in the title-clinching Game 2 for the powerhouse Eagles. Ravena, who also flirted with a triple-double of 21 points, 10 rebounds, and 9 assists in the best-of-three opener, averaged 29.5 points, 8.0 rebounds, 7.5 assists, 2.5 steals, and 1.0 block in the series. Regardless of which school won the championship, a bonfire was sure to burst forth in Katipunan. And sure enough, the amber flames blazed hot over the blue side, sealing another dominant year for the league’s budding dynasty. Dominance was also the recurring theme in the Grand Old League as the San Beda Red Lions waltzed to the NCAA Season 94 title, completing their fifth three-peat in school history and nabbing their 11th title in the last 13 years. Some drama colored the series, though, as CJ Perez of title-challenger Lyceum got suspended for Game 1 of the finals for failing to formally inform the NCAA of his application to the PBA draft. But San Beda coach Boyet Fernandez cleared that San Beda did not fuel the controversy, and by Game 2, the Lions proved they could still sweep the Pirates with Perez there. Benchwarmer-turned-superstar Robert Bolick wrapped up his collegiate career with 3 titles in as many years in the NCAA while the ever low-profile Javee Mocon finished with 4 championships and the Season 94 Finals MVP plum to boot. Their individual successes translated well into the 2018 PBA Rookie Draft as Bolick was selected third overall by the NorthPort Batang Pier while Mocon got off the board at sixth to the Rain or Shine Elasto Painters. Back in the UAAP, a select few youngsters proved that they are not afraid of the big crowds and bright lights as they immediately made their names known in their respective rookie seasons. Amid consistent fan criticisms that have become second nature to foreign student-athletes, Ateneo’s 21-year-old Ivorian tower Angelo Kouame blocked the noise (and a lot of shots) to cruise to the UAAP Season 81 Rookie of the Year award. He finished his first year already second in MVP scoring with averages of 14.6 points, 13.8 rebounds and 3.1 blocks, helping the Blue Eagles to back-to-back titles. The 6-foot-10 super athlete has since went on record saying that he wants 4 more titles in his collection. With head coach Tab Baldwin reportedly in for the long haul, it’s not hard to envision such a wish coming true. Few players, much less rookies, have captivated crowds the way UST’s CJ Cansino did in Season 80. With their big man Steve Akomo prematurely ending his UAAP career with a blood clot issue, Cansino stepped up big time and breathed life into a season well on its way to being lost. Unfortunately, his unyielding heart and hustle got shot down in the blink of an eye as he suffered a much-feared ACL tear just as UST was clinging on to a last-gasp Final Four shot. Despite the unceremonious end to his rookie year, the Season 80 juniors MVP finished with averages of 12.8 points, 10.3 rebounds and 3.6 assists, highlighted by a record triple-double, the first made by a rookie since the league started official statkeeping in 2003. Cansino has since entered an arduous eight-month-long rehab towards Season 82. Being the son of PBA legend Danny Ildefonso is enough pressure, but NU Bulldogs rookie Dave I. is no stranger to such a concept. After helping the Ateneo Blue Eaglets grab the Season 80 juniors championship, the 19-year-old young star jumped ship from Katipunan to Sampaloc to join his brother Shaun and his dad Danny in the Bulldogs’ steady rebuilding phase. Even after being at the center of a controversial recruitment issue with Ateneo head coach Tab Baldwin, the youngest Ildefonso just kept playing at the highest level in his new home team. The effects of the retooling have not yet materialized as NU finished with a seventh-place 4-10 record for the season, but the youngest Ildefonso quickly established that he truly belongs with the big boys. The 6-foot-4 swingman finished his first year with averages of 15.2 points, 5.6 rebounds and 2.8 assists, showing that he’s already the best player on the team in such a short time. Of course, nothing less is expected from the Ildefonso name.